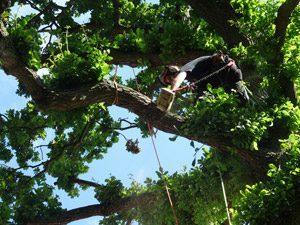 When you require a firm of professional tree specialists, then look no further than The Original Tree Surgeons. If you have any issue with trees on your property – whether they are decaying, looking unsafe, blocking light or access, then leave it to us to remedy the problem. With decades of experience in the field, it is no exaggeration to say that we are tree specialists! Based in Tunbridge Wells, we work extensively throughout Kent, East Sussex, Essex and Greater London. Every assignment we undertake is handled with the utmost care and attention, adhering to the highest safety standards. We act on behalf of homeowners, private landlords, estate managers or anyone with responsibility for tree stock within commercial properties, such as schools, colleges or hospitals. The Original Tree Surgeons always respond promptly, initially providing a free site assessment, as well as a full quotation ahead of commencing any works. We are fully insured, with both public liability and employee’s liability insurance of up to £5million apiece. When you are in need of a firm of tree specialists, no matter how large or small your requirements, contact The Original Tree Surgeons on 01892 599331.